MX1 : Monea opens victory account with impressive second moto. 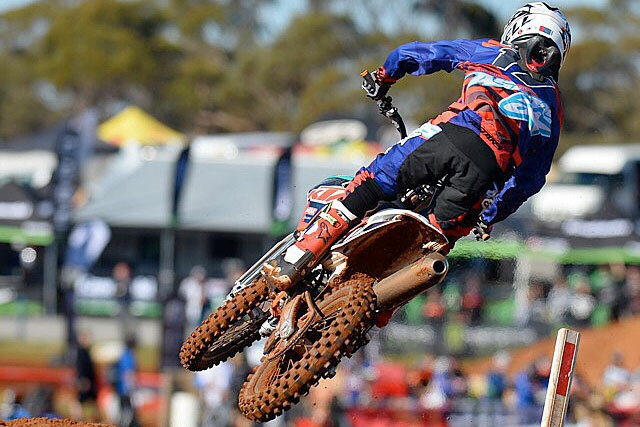 KTM Motocross Racing Team’s Kirk Gibbs has taken a home victory in round four of the 2015 MX Nationals at Murray Bridge in South Australia this afternoon. Gibbs led on the opening lap early before Dan Reardon took charge, but it was Gibbs who soon reclaimed the lead and went on to lead the entire moto for the victory. Reardon sat second until a few minutes remaining, when teammate Kade Mosig made his way through, bumping Reardon back to third. A late charge from Mosig saw him fall short of the victory, seeing Gibbs the winner from Mosig, Reardon, Adam Monea, Luke Styke, Dylan Long, Cody Cooper, Lawson Bopping, Jesse Dobson and local standout James Booth-Elliott. The final moto victory in the premier class went to Super Pole winner Monea, who was able to make his way past Gibbs in the middle stages of the moto and controlled it from there. In the end Monea won the race from Gibbs, whose second place was good enough to secure the overall win and increase his points lead in the process. Third for the moto and overall for the round was Reardon, while Lawson Bopping and Dobson filled the top five places in moto two this afternoon. Positions six through 10 featured Mosig after he went down in the whoops, Styke, Long, John Phillips and Aaron Tanti. Updated overall round results and championship standings will be added when supplied by the MX Nationals series organisers. MX 2: Clout maintains red plate despite qualifying injury scare. 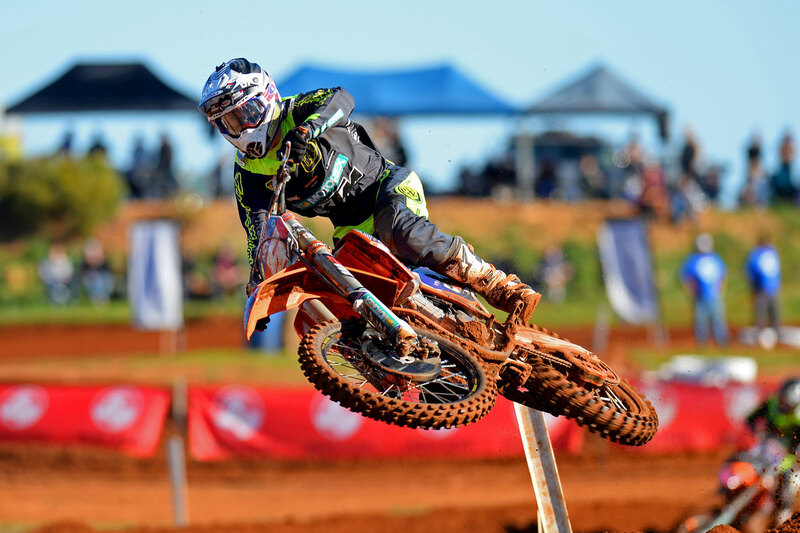 KTM’s Caleb Ward made a triumphant return to the 2015 MX Nationals at Murray Bridge in South Australia today, winning his first overall of the season upon return from a knee injury. Ward took a breakthrough win in the opening 30-minute moto, working his way past early leader Geran Stapleton in the opening laps and then running away at the front. Second was Luke Arbon in what was also an improved performance from him this year, holding a fast-finishing Taka Katsuya at bay on the final lap, while Jay Wilson overcame a smoking YZ250F for fourth. Stapleton eventually crossed the line fifth, while Nathan Crawford, Kyle Webster, Wade Hunter, Jed Beaton and Luke Clout rounded out the top 10. Series points leader Clout was down the order after he went down heavily in qualifying earlier today. It was privateer standout Riley Graham who led out of the blocks in moto two and maintained that position for a number of laps, before Arbon took charge and led the mid-stages of the moto. Arbon came under fire from moto one winner Ward, who was able to work his way to the front in the final laps for the clean-sweep and overall victory. In the moto it was Ward the victor ahead of Arbon, Hunter, Kyle Webster, Katsuya, Dean Porter, Wilson, Graham, Clout and Stapleton. Overall it was Ward with the sweep, from Arbon and Katsuya in yet another consistent podium finish. Clout managed to hold onto his red plate.